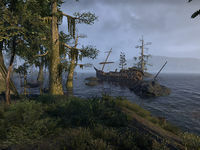 Bitter Coast is the southwestern coastal region of Vvardenfell. It stretches from Khartag Point in the north, past the Redoran town of Balmora on the edge of the West Gash, to the Gold Coast Trading Company/House Hlaalu outpost of Seyda Neen in the south. The Ahemmusa Ashlander Camp can be found in the region. This page was last modified on 19 March 2018, at 05:24.